Anne-Marie Faiola is The Soap Queen, with videos, websites, a store and all sorts of soapy goodness going on in her life. So a soap book by her is something to get enthused about, because you know it will be carefully written with great projects and good, solid recipes and safety instruction. The beginning covers safety when working with the chemicals involved making soap. Okay, chemical, because the major safety issue is working with lye. She explains how to work with it safely in a non-scary way that will help you feel confident about using it. It also explains the difference between types of soap crafting, from making hot or cold process soap, rebatching and using melt and pour bases. There is a vocabulary section that explains the terms used in soap making. This section also covers some of the ingredients, supplies, colorants, fragrance and the equipment you'll need. Then the recipes- the recipes are for cold process soap, and it's so far beyond those bars you can buy in the store that it's a completely different product. Using oils you can buy in a lot of different places for specific features in a soap, and having gorgeous swirls, whirls and stripes of color that turn the soap into a work of art. The recipes focus on ingredients with amazing color techniques. Castile soap, soap with yogurt, beer, coffee grounds and clay, using techniques to make the soap look like stained glass, tie dye, marbleized techniques and high and low contrast effects. It's spiral bound to lay flat, and the photos are in full color with lots of photos to show how each coloring technique is done. The recipes are well-written. 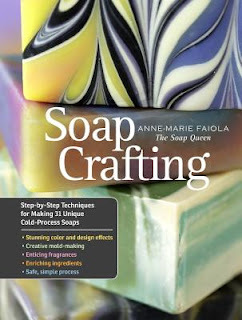 While a lot of soap books that involve color use aren't good for beginners, this one is good for many levels of soap crafter. From the absolute beginner to someone confident in soapmaking who wants to learn new color techniques and recipes. Like Storey on Facebook for recipes, crafts and chances to win books from them!